Since its inception in the late 1800's, the Gaslamp Quarter has gone through multiple periods of growth, change and complete overhaul, becoming the popular dining, shopping and entertainment district it is today. Gaslamp was once known as a stomping ground for cowboys, gamblers, and as an epicenter for the world's oldest profession. Citizens included the likes of Wyatt Earp and all that followed in his biography (good and bad). We can't lie, this all adds to the allure of the Gaslamp District although there were less exciting times in the 70's where pawn shops and seedy bars (less glamorous sounding than old time casinos and saloons) lined the streets. The business community rallied the political troops and dumped a pile of investment into the zone and over the decades since, the Gaslamp Quarter gradually transformed into one of the most popular tourist destinations in San Diego, showing no signs of slowing its momentum. All you really need to do here is pass under the Gaslamp coridoor sign and get your cash and credit cards ready. This place is packed full of fun, fashionable, and unique stores to satisfy the spending habits of anyone in your party. The Betty Paige Boutique shop is a fantastic homage to the syles of the burlesque queen, while vintage AND contemporary items can be found in the pretty in pink Dolcetti Boutique. A Quiksilver Boardriders Club store is on site for the surf and skate shoppers and an Urban Outfitters applies to pretty much everyone. 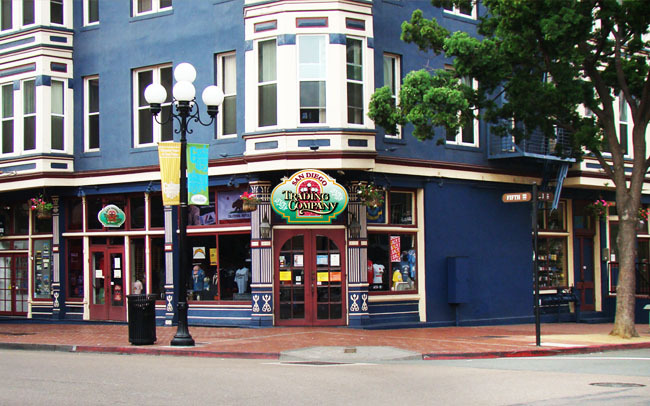 You'll want to bring home a souvenir slice of San Diego by stopping at the San Diego Trading Company store, or kiosk. Don't want to miss anything? Looking for that secret store with hidden treasures and one of a kind items not to be duplicated back at home during your personal fashion show (office, mall, dinner party, etc...)? Then try out one of the most unique tours in San Diego - the Chic Fashion Tour - which will take you to all the best shopping spots in the Gaslamp District. You may even learn a little history along the way. One thing that hasn't changed about the Gaslamp Quarter is the popularity of its nightlife scene, although with much more polish. Gamblers and outlaws have been replaced by socialites and hipsters, complete with a "something for everyone" establishment landscape that accommodates party goers, lounge hounds, live music afficianados, and casual drinkers. Be sue to stop by the Hard Rock Hotel for one of two venues. 207 is a laid back glamor lounge that whispers "martini please" in your ears, while Float, with its pool side cabanas, fire pits and open air atmosphere breathes live into those seeking more vibrations in their nights festivities. Everyone knows that Irish Pubs are a blast so you know what to expect at the bar & live music destinations, Blarney Stone and Patricks II. For beer & sports, and beer sports(billiards, etc...), fans, Jolt,n Joe's will do the trick. The list of hotspots in Gaslamp is practically endless so even without a plan, you can step foot into this district and expect the night time of your life. Bring an appetite to Gaslamp as its diverse selection of eateries will keep your belly smiling from dawn to well past dusk. Our choice breakfast/ brunch spot is the aptly named Broken Yolk Cafe known for its home cooked vibe and massive omelette selection. Get ready for lunch munchies at Brian's24 (as in open 24 hours a day) for fan (us!) favorite Fried Chicken & Waffles. Stop by the Melting Pot Fondue Cafe for a sweet tooth soother before embarking for a late dinner at the Lincoln Room, which has a definite historic Gaslamp feel to it, or to the more contemporary (but still classic) Jimmy Loves, which segues into quite the nightlife scene after dark. We're big believers in the "When in Rome..." concept and thus we suggest sticking to the whole Gaslamp appeal when selecting your accommodation. Sure all of the requisite hotel chains are on site should you feel more comfortable with what you know, but the fact that you are staying in this district tells us your tastes may lie better with the likes of a quaint accommodation such as the Gaslamp Townhouse, the historical European styled Gaslamp Plaza, Victorian charmed Horton Grand, or the expansive Starwood owned, yet explicitly regal, US Grant. There's always something going on in the Gaslamp but there is no question that in a historic place like this, that two stand outs stand as "can't miss" events when in town - Fat Tuesday Mardis Gras and St. Patrick's Day. If your vacation or weekend getaway is focused on heading to the Gaslamp Quater, then plan around either (or both!) of these two annual festivities. For a complete listing of events in the Gaslamp Quarter, click here.